This non sticky Hair Serum adds gloss and shine to the hair, the natural ingredients in the serum helps to moisturize the hair. Hair stays shiny, nourished and manageable all day. It also protects hair from external factors such as heat, dust and humidity. It helps untangle hair making it manageable. Plant based ingredients help condition and smooth hair, restores a healthy look and feel to hair. 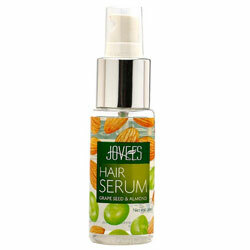 Hair Serum works best on clean hair. Apply a coin sized amount on wet hair. Style your hair accordingly. Use daily. Almond Oil, Olive Oil, Wheat Germ Oil, Safflower Oil, Broccoli Seed Oil, Grape Seed Oil, Soyisoflavone and Niacinamide.